The older I get the harder it is to bounce back after any kind of hard work. Whether it be gardening, chopping wood, cleaning chicken coops, taking a long walk through the woods or going to the gym, I now get sore easier and it lasts longer. Muscle pain can really put a cramp in your day (pun intended) and since I'm not a fan of over the counter or prescription medications, I often turn to home remedies to help with muscle pain and inflammation. Speaking of the gym, I have a serious love hate relationship with the gym. I love to be in the gym, but I hate to go there. So when ends up happening is that I never go and when I finally do, I way over do it. That is not a recipe for a great feeling body! In fact, that is my #1 way to make myself sore for 3 days. It's inevitable that I'll have sore muscles for time to time. The question is how to get rid of the soreness naturally? I have a few different methods I use from muscle rubs and essential oils to herbs and stretches. Epsom salts are actually magnesium sulfate from an area called Epsom which is in England. It hasn't actually been proven that these can soak into your body through your skin...but a soak in a warm bath with Epsom salts sure does help me feel better! The gentle stretches of yoga can help relieve muscle pain. Be careful not to overdo it! Simple poses like the child's pose, sphinx pose or standing forward bend can help ease muscle soreness. Contains magnesium chloride which works as a muscle relaxant. Rub into the store muscle for relief. I have this magnesium oil right now, but I'm working on making my own. 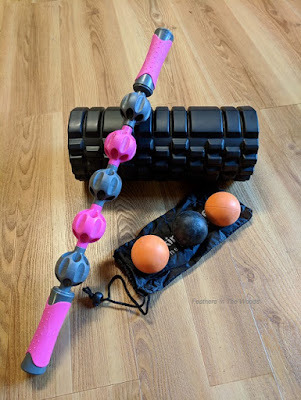 Whether you getting a professional massage, have someone help you, or use a massage tool like a roller stick, a foam roller, a set of massage balls, or even just use a tennis ball....massage can help by increasing blood flow to the muscle which speeds up the removal of the inflammatory chemicals that cause soreness. Just be gentle and if it hurts to much, stop. No equipment? Try these 12 Stretching exercises for muscle pain relief. Many essential oils can help muscles soreness just by breathing them in. Add them to a diffuser and place it nearby. Eucalyptus, lavender and Rosemary all can help with pain relief when inhaled. Some essential oils work best when rubbed into the sore muscle. Lemongrass, camphor, peppermint, sage, Cypress, cardamom & marjoram are all said to help. To use EOs in massage: mix 1-2 drops of EO with a carrier oil like coconut or sweet almond oil. Massage gently. Applying heat to sure muscles can help reduce swelling and relax muscles. A heating pad or even a hot shower can help. I'm particularly guilty of cranking the electric blanket to high and resting under it for about 20 minutes. Yes, it hurts to move the sore muscles, but it actually helps by easing the tension and stiffness in the muscles. If your muscles are tense, they'll stay tense unless you move them. Just don't overdo it or you'll end up in worse shape then when you started! Cherry juice is high in antioxidants called anthocyanins which help reduce muscle soreness by reducing inflammation. A full night's sleep gives your body time to heal. Your body releases it's biggest surge of growth hormone during REM sleep, so a solid 8 hours can help you heal faster. A natural anti inflammatory, turmeric is my go-to supplement when I'm suffering from muscle soreness. Ginger is another natural anti inflammatory herb. Ginger also helps improve circulation and blood flow which helps damaged tissues to heal. I like to drink ginger tea made with fresh ginger. Arnica helps by reducing swelling. 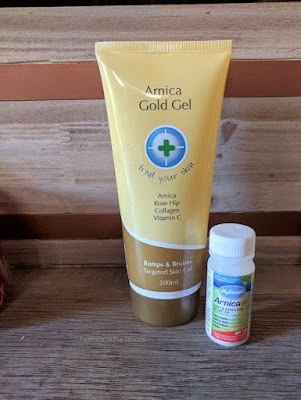 I have an arnica gel I swear by for muscle soreness. I once loaned it to a masseuse who had sore hands and she couldn't believe how much it helped! I also have arnica homeopathic tablets I use for all over soreness. Low levels of magnesium can lead to muscle aches and cramping. 57% of Americans do not get the recommended amount of magnesium daily. Taking a magnesium supplement can help. Natural sources of magnesium include: almonds, cashews, sunflower seeds, spinach, black beans, flax seeds, cocoa powder and molasses. Bananas are a popular after workout snack because of their potassium content. Potassium deficiency can cause muscle weakness and cramps. Adding a tablespoon of ACV to a glass of water can maybe help relived muscle soreness. Though I can find dozens of people who swear by it, I can't find out why other than 'alkalizing properties'. Maybe it's the magnesium content? Try it and see....ACV is so full of probiotics and other good stuff that it certainly can't hurt! Capsaicin is often used to relieve pain from arthritis and other joint or muscle pain. It's available in many over the counter creams and muscle rubs. Check out WebMd to see why. Dehydration can cause muscle soreness so it just makes sense that being hydrated can help in these cases. Muscle soreness should only last a few days. If it lasts longer then a week you might need to see a doctor. Hopefully these home remedies for muscle soreness will help you too! Want more posts on taking care of your health naturally? Click here for my other posts on natural healthcare! Excellent tips! I don't know what I'd do without my zillion foam rollers, balls, sticks, etc after my nightly workout. Definitely trying some of the others as well. Found you through Coffee With Us 3 Link Party.